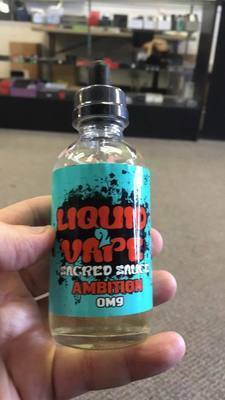 Sacred Sauce is the newest edition to the Liquid2Vape line of ejuices! With maximum flavor and cloud production, our SACRED SAUCE line will not only blow your mind but will have you asking yourself how a can you get a "PREMIUM JUICE" for such a low price! Ambition - A Strawberry Funnel Cake that will become your all day vape! Evolution - A Cinnamon Sugar Cookie mixed with a light and creamy Custard. Billie Pom - An EXPLOSION of flavor with Watermelon, Peach, Pineapple, Pomegranate and Raspberry! Randall Road - Like the Red Vines Licorice Candy? Then you will L-O-V-E this flavor from our Sacred Sauce line! Minions Reserve - Golden Honey Graham Cereal with roasted nut clusters all drenched in a creamy milk base and covered with ripe bananas! OOOkay - Strawberries and cream mixed with a little caramel vanilla custard. OMG we did it again!